Ava is a whiz with words. She's a perfect speller (acing every test in fifth grade) and fascinated with palindromes, homonyms, metaphors, similes, and everything else word-related. She's also quite a writer. But most of all, she's a loyal sibling. Seeing her older sister Pip struggling to navigate the social minefields of seventh grade, mobilizes Ava to take action. 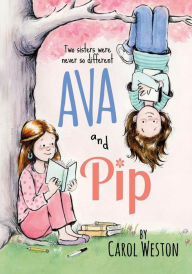 When a new girl in school Bea lures all of Pip's friends away, Ava pens a story that attacks the girl. It seems harmless and cathartic, but when the story gets published, Ava discovers that being nasty to others has a way of coming back to you. I grew a bit weary of the wordplay, but younger readers will probably find much of it to be giggle-worthy. What I did like was the close relationship of Ava and Pip, and the honest and open communication between the maligned Bea and Ava. In fact, pretty much all of the human interactions in the book felt honest and real. After reading so many books for teens where the drama usually centers around people not communicating, it's nice to see children and adults being intelligent and responsible, even when they are also flawed. It would have been so easy to blow up the conflicts in this book, but Weston lets everyone just work things out. The overall result is a gentle story about kids learning communication and social navigation skills.